Check out our blog, sign up for our emails, join our Facebook page, follow us on LinkedIn and Twitter. We want you to be involved with the Innovation Economy in West Virginia! Explore all the exciting resources we've found throughout West Virginia to help you get started in the innovation economy. On April 6, 2016, TechConnectWV hosted “Growing Innovation in the Mountain State,” featuring Brad Smith, CEO of Intuit, a policy forum designed to set a course for West Virginia’s tech economy. According to a survey commissioned by TCWV, the WV Department of Commerce found that 48,553 people worked in science, technology, engineering and math (STEM) related fields in the state in 2015. TechConnectWV is leading workforce efforts so that West Virginia can compete for millions of unfilled cybersecurity jobs. West Virginia is endowed with vast natural resources that help power our nation, and the state’s energy industry continues to be major driver for the state’s economy. Moreover, recent developments involving ethane production from shale formations provide major new economic and employment opportunities for the state..
TechConnectWV is a non-profit coalition committed to the advancement of the innovation economy in West Virginia, focused on four technology sectors: advanced energy, chemicals and advanced materials, biosciences, and biometrics. With broad representation from private industry, the public sector, and higher education, TechConnectWV seeks to diversify the state’s economy, promote economic prosperity and create high-paying jobs. 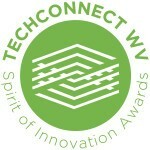 TechConnect’s Spirit of Innovation Awards, designed to celebrate success and showcase innovation in the State of West Virginia, were presented November 16, 2015 at the West Virginia Culture Center in Charleston.